Commonly know as the Cinnamon Clownfish (Amphiprion melanopus) is sometimes mistakenly referred as the tomato clown. The major difference in between both clowns is that Cinnamon will have its feet or the pelvic fin much darker as compared to the tomato. Cinnamons are widely found in the Pacific region. Like other clownfish they too form symbiotic relationship with sea anemones. They are shy in the beginning but with time they do become aggressive to their space. 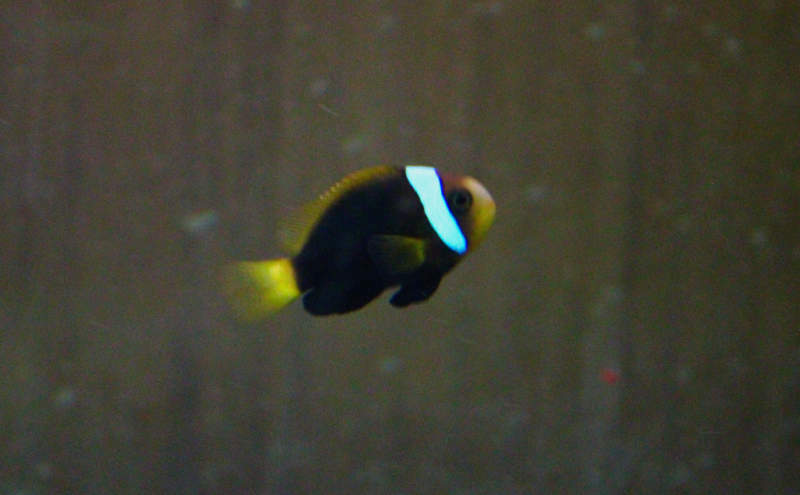 Cinnamon Clownfish are being now aqua-cultured for the hobby all-round so the colour may vary. Their body is dark with the tail and the side fin yellow to orange. White band is present before the eye which is much thicker compared to the pink skunk clown or the tomato clowns. They are easy to keep and very hardy in nature. They would eat most of the pellet and flaky food. Keeping tank breds are much easier to keep and feed as compared to wild caught. I have found the Cinnamon Clownfish to be much hardier compared to the Amphiprion ocellaris. In India this fish will be found at most of the shops who are dealing in marine life. I would also say if you are planning to keep damselfish then this clown is perfect due to its Semi-aggressive temperament. This fish can also be called as a perfect starter clownfish.